You’ve gotta just love Aimie and Ted! I officiated their intimate evening wedding ceremony at The Willows Lodge this month. I joined them on one fine weekday evening to learn that just a few hours before, they arrived at The Lodge on their bicycles! 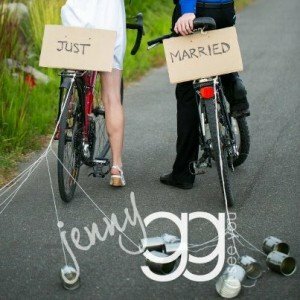 So, of course, Photographer Jenny Goldberg-George had to get this grand photo of them “driving away” from their ceremony, bicycles adorned in signs, ribbons and cans. I adore the creativity of a wedding, big or small. I especially love the tiny, thoughtful and funsy elements that don’t cost much and add such a personalized flair or feel to a ceremony moment or to a wedding day.